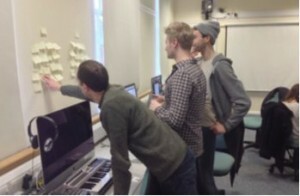 During the 2013/14 academic year I introduced a new final year module Design Thinking to the Creative Media Technology curriculum here at Leeds Beckett University. Design Thinking is a human-centred methodology that uses co-design and intuitive problem-solving techniques to match people’s needs with what is feasible and viable. It was pioneered by IDEO in the late 2000s nad has attracted much attention in the past few years. The idea is that by combining empathy, creativity and analytical processes, true (and sometimes radical) innovation can emerge. The methodology also fits in well with the learning principles in a Higher Education final year module. It offers an opportunity for situated learning to take place: students collaborate in order to find creative solutions to a given problem, under the guidance of an experienced tutor, through engagement with potential end-users and in an authentic environment outside of the classroom. Create a virtual writing coach that helps aspiring and active writers develop their practice and keep their projects on track. Create a mobile companion app to a weight management program that is currently based on facilitator-run face-to-face group meetings. They formed groups and set out to tackle the challenge. At first the Design Thinking approach seemed counter-intuitive and confusing. For example, why engage with end users before they themselves had engaged with the given challenge in their role as designers. They wanted to create an artefact first and then get feedback, rather than explore with users what that artefact may be before designing a first prototype. This is in line with a lens of design as a profession, almost an engineering discipline, with a set of practical skills and rules to obey that can be applied to a given problem. Through this lens, design seeks to find specific solutions rather than develop ideas further or empathize with the user, and at the beginning of the course students were indeed well trained to follow this introvert approach. The same became evident during the Ideation phase when many students had to be repeatedly reminded that it is not about finding solutions just yet – a problem also observed by others in HE. Firstly, we believe that Design Thinking – or human-centered design in general – should be an integral part of the higher education curriculum for any design-oriented degree right from the start. Our perception was that by introducing this in the final year of study, we had to ‘un-teach‘ some of the practices that students had come to take for granted, in particular the view of design as a linear process driven by the desire to manage it carefully – also referred to as ‘engineering design’. As soon as end users join the design process as co-creators, more uncertainty is introduced and a robust process such as the d.school 5-step approach used here is required to maintain manageability, for novices and experienced designers alike. Secondly, students need to feel empowered and supported to go outside of the higher education environment to talk to potential end users. Providing a good set of method cards helps, as does a practice-run in order to refine interview skills and raise awareness of why observing and talking to end users is critical to the design process. Thirdly, it is important to create a relaxed, non-judgemental atmosphere for all idea generating activities so that new and unusual ideas can emerge. This is not a new insight (see Osborn’s Applied Imagination, published in the 1950s) but it is worth reminding of in an education system that is more often than not focused on analytical thinking, solution finding and rigid processes and schedules. Full observations, results and lessons learned will be presented at a conference in summer 2015 (paper to be uploaded here soon). Watch a video of one of the student group’s service design proposals: WriteTime, a virtual writing coach that helps aspiring and active writers develop their practice and keep their projects on track. 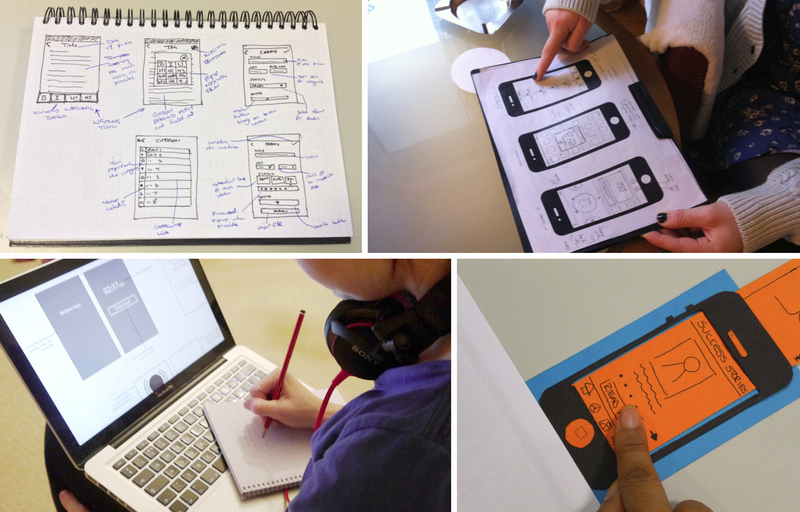 This entry was posted in News and tagged design thinking, education, interaction design. Bookmark the permalink.